Details: World Book Night is an annual celebration dedicated to spreading the love of reading, person to person. Each year on April 23, tens of thousands of people go out into their communities and give half a million free World Book Night books to light and non-readers. World Book Night is about people, communities and connections, about reaching out to others and touching lives in the simplest of ways—through the sharing of stories. 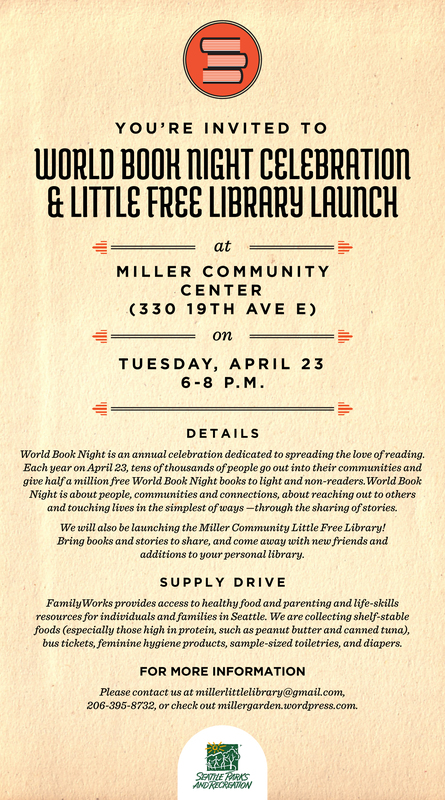 We will also be launching the Miller Community Little Free Library! Bring books and stories to share, and come away with new friends and additions to your personal library. Supply Drive! FamilyWorks provides access to healthy food and parenting and life-skills resources for individuals and families in Seattle. We are collecting shelf-stable foods (especially those high in protein, such as peanut butter and canned tuna), bus tickets, feminine hygiene products, sample-sized toiletries, and diapers. For more information, please contact millerlittlelibrary@gmail.com or 206-395-8732. Entry filed under: Little Free Library.